Since scorching the screen as Silk in The Dirty Picture, Vidya Balan takes on another challenging role as a pregnant mother in Sujoy Ghosh’s Kahaani. Vidya plays an expectant mother looking for her husband in the vast and bustling city of Kolkata. Vishal and Shekhar have been one the most consistent musical duos in the past year with the brilliant Ra.One. Yet here they take over gritty territory as the music reflects the tone and feeling of the movie so well. Like the city itself, the soundtrack makes balances many genres and shows unexpected layers within the music, which begs a repeated listen! Aami Shotti Bolchi starts the album with a rollicking bang, as the jazzy score hooks you in with the arresting cello chords and all the orchestration around it. With Kolkata’s great chanteuse Usha Uthup at the helm, the song just pulls you in with the provocative lyrics. Aami Shotti Bolchi, which means I’m telling the truth, is such a great track that details the almost schizoid dualities within Kolkata. Uthup’s voice sounds just wicked on this track, as she sounds completely at home with the jazz sound and she keeps up when the heavy metal kicks in. The heavy metal sounds in the chorus are so addictive, and unusually it’s Shekhar growling like a long-lost member of Slipknot on this fabulous track! The powerful guitar riffs during the chorus lines just implore you to start head banging along. Definitely one of my favourites on this album. Another absolute gem on this album is, Piya Tu Kaahe Rootha Re sung by the inimitable Javed Bashir, who you just long to hear more from. The haunting manjheera laces the track throughout and all the street sounds during the song come together in such an interesting and beautiful fusion. Bashir sounds just resplendent, varying his voice for the antaras and making this tune, one that will stick with you. The aggressive guitar riffs complement the tabla beats so well, and it works so well in creating a sinister mood for Kolkata, which is likely its own character in the film. The lyrics too are lovely, and Bashir conveys the dard and desperation. The album works so seamlessly as a concept album, conveying the mood of the title character and reflecting the bustling energy of the city. 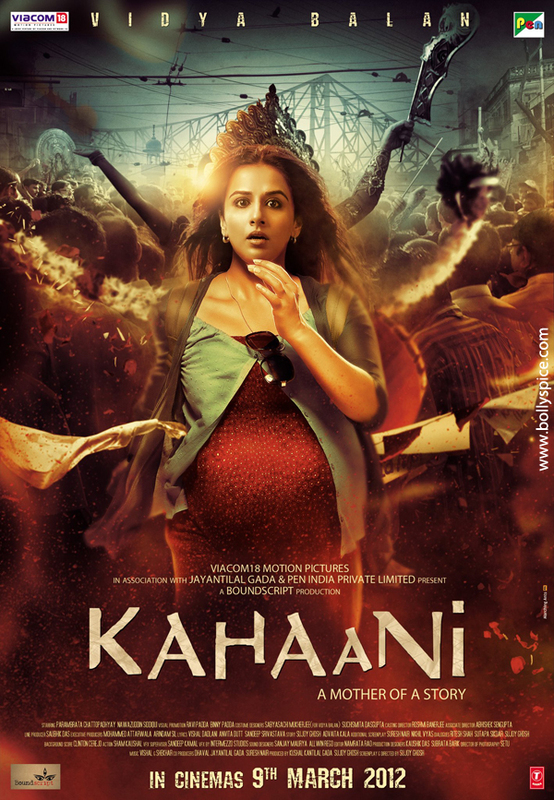 Next up is the rather ordinary, Kahaani, which is sung by KK and Vishal in the main version of the song. However, what makes this track worth savouring are the innovative lyrics, which involve detailing the noises of ‘taxi ke baawre’ and ‘tram ki ghanti’ of the city. Certainly, the lyrics work in highlighting how noisy and bustling Kolkata is to Vidya’s character. As a situational tune, it works very well but the simple composition may make this one a tad ‘blehh’ on such an otherwise boisterous album. Shreya Ghosal sings the female version of the song. The new trend these days on albums to feature acoustic and minimalist arrangement is definitely a welcome addition in this case. Ghosal sounds so succinct and lovely. Out of the two versions, the unplugged one begs a repeat. Tore Bina features a splendid Sukhwinder Singh at the helm. It begins with a lovely folksy intro and accompanied by acoustic guitars, which merge impeccably. The way the guitars and arrangement peaks around the chorus is just so addictive and will have you singing along imminently. Singh sounds so wonderful here and his voice is so flawless on this track that when he reaches the quieter parts he just sounds so tender. The bridge of the song, with the humming and backbeat kicking in just makes the composition something to praise and savour. The lyrics too are eloquent and it complements the overall tone of the album so well. Concluding the album we have, Ekla Cholo Re, Vishal and Shekhar’s superlative version of Rabindranath Tagore’s famous poem. At the mike, we have Amitabh Bachchan who sounds so good in this slower version of the poem. The choir that sings in the chorus often act as translators of the gist of the poem in English are melodious and haunting. Thankfully, the English here is not too bogged down with fancy wordplay and is succinct which aids in the song’s overall message. Bachchan always sounds lovely when singing slower songs, and in this gem, he is tender and sombre as well as keeping his characteristic verve. Kahaani is truly one of Vishal and Shekhar’s best albums of their career. It conjures up a wonderful tribute to Kolkata and works seamlessly in creating a mood for Vidya’s character caught up in this foreign place to her. The music is accompanied by innovative and poetic lyrics, which makes this an album to savour and enjoy for a long time. 15 queries in 0.492 seconds.